Some people think of a web design as a one-time thing: you tell the designer what you want, they build it, that's that! If that's what your last designer did, you got robbed. We LISTEN to you. We start with a pre-consult, to gather information and direction. This helps us coach you during your free one-hour consultation, where you tell us what your goals are for the site, and we help you get clearer on them and how to realize them. Clarity begins at home! Set Strategy: to make sure you don't miss anything during the consult, ask us to type up notes, adding a draft timeline and budget. We charge a little for this, because you're free to use it to shop around. Gather Equipment: If we work with you to finalize the proposal and you sign us up, we collect your existing marketing materials, line up the team we'll use for your site, and head for first base. Game Face is a face-to-face design company --- that's why we don't look for clients in Manhattan or Albany. Plan for more meetings and phone calls while we're still in the locker room going over the game plan. 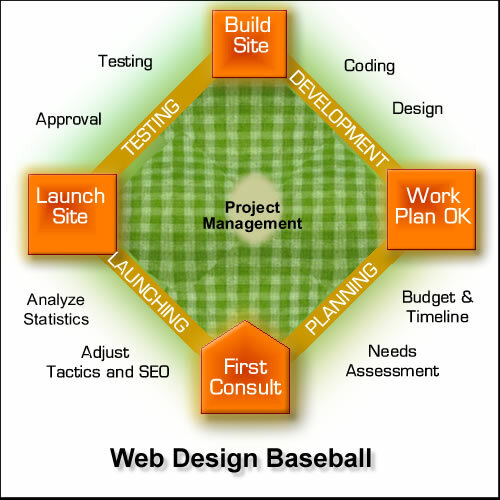 Design: We have many designers to call upon, depending on the type of site you need. From in-house to co-contracting, from high-corporate to free and funky, we'll match you with the right person for your needs and budget, and make sure you end up with designs that don't grow old for a long while. Coding: If your site requires special forms, calculators, or other programming, we find a coder who will stay with the project start to finish, and "comment" the code so that others can follow behind if necessary. Tools and team in hand, we put your design and your content together and develop your site. This includes laying out each page, writing and revising copy, and applying search engine strategies to help people find your pages even if they don't know you yet. Testing: Once the content and pages are in position, it's time to test the site. If you have an online store, or there is coding involved, we run through every possible path, with the same due diligence you give your own work. Approval: Your approval and sign-off are required (in an e-mail, at minimum) before we let the public see your new site. We strongly recommend you bring in employees, friends, and other stakeholders before you give us the green light. Once it's launched, it's launched: You only get one chance to make a first impression. The ball is in play when customers can find your site. What leads them there? You'll hopefully have some budget for advertising (print, radio, skywriting) that sends people to you. We don't smash champagne bottles against computer screens, but we do help you plan a launch that gives momentum to your marketing. Keeping Score: All our hosting clients get instant, free access to graphs and charts of data about how people search for their sites, and what they do when they find them. If you ask us to, we'll track these for you, and provide monthly recommendations for how to improve search terms and on-site sales. Adjusting Tactics: If you're reaching your sales targets, you're home! But it's a good idea to budget for some additional adjustments as you see the statistics and recommendations, to help you keep earning home runs. If your growth curve ever flattens out, we'll point you to our own coaches who can take you to the next level. No problem. We know this stuff --- so you don't have to. We also know that your website is only one part of your marketing plan. How does it fit in with the other parts? Here's one last sports metaphor for your consideration: Marketing Golf. Ready for a Game Face? Set up your Free Consult today!